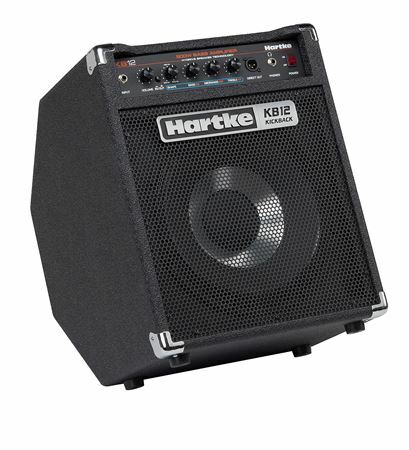 Shop Hartke KB12 Kickback Bass Combo with 12" Hydrive Speaker 250 Watts from AMS with 0% Interest Payment Plans and Free Shipping. Extraordinary performance in a ruggedly portable, high power, tilt-back package, the KB12 Kickback bass combo features the added muscle of a 500 watt Class D power amp and a premium 12” HyDrive speaker. The KB12's 12" HyDrive speaker features Hartke’s patented paper/aluminum hybrid cone technology for an exceptional blend of warmth and transient attack that can't be attained by traditional all-paper bass speakers. The use of rare earth neodymium magnets provides lightweight portability without sacrificing any of the legendary Hartke tone. Designed to produce a responsive bass tone that’s both tight and warm, the KB12 preamp provides users with comprehensive tone control. Quickly dial in tone adjustments with the perfectly tuned 3-band EQ and Hartke’s exclusive variable “Shape” circuit. When activated, the “Shape” knob varies the frequency range of a unique, fixed EQ curve that generates a dramatic variety of tone, color, and harmonics. In addition to sitting upright, the KB12 can be placed in the "kickback" position for better on-stage monitoring and clarity. The KB12 also features a headphone output for practice and a balanced XLR direct output to the mixer for live performance. 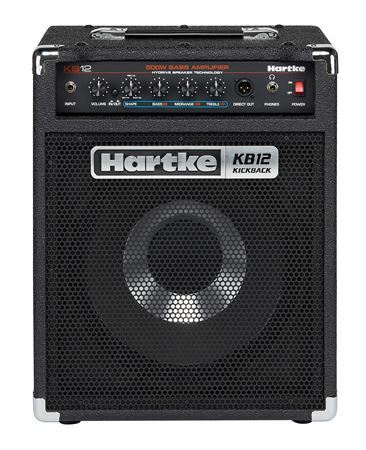 With all new high power amps and HyDrive speakers, the Hartke KB12, and its big brother the KB15, have re-defined the standard for professional bass combos. I’ve used this little amp now for almost a month and it has really met my expectations. I’ve used it for practices and a couple of small venues and it has plenty of kick to keep us with the rest of the band. The best part is all the punch being delivered out of just a 28 lbs amp! Great amp and being only 28lbs, It sounds great on stage and easy to move. That's awesome. I bought this amp as a convenience to playing small bar gigs with my cover band rather than lugging a bigger rig when there's tight space and I was shocked at the power this little amp has. Loud and clear, great EQ voicing and light weight. The tilt back feature is great for aiming the speaker at a 45 degree angle, it let's you hear your sound and work like a monitor even when direct input into the PA. I always find that floor wedges aren't good enough for bass or in certain venues and not hearing myself can sometimes make me play harder than I want to or need to for certain songs. If you're looking for a small practice amp, small gig amp then this amp is for you.